A friend asked me to give a talk in his class about writing game design documents. This is a challenging task. Not just the writing – even simple games have a lot more moving parts than it might seem on the face of things – but specifically the task of teaching people to write good documents. Nothing teaches like the crucible of game development itself. So for me, the first step in knowing how and what to write is to make games. Learn firsthand what needs to happen, the multitude of mechanics and assets that need to be created, how communication succeeds and fails in the course of production. Roll up your sleeves and jump right into building the plane in flight. I used to play a game with myself while waiting to get picked up from school. I spent a lot of time in the same small spaces. Pre-smartphone (what am I saying? Pre-Internet) this meant reading or doing homework or simply sitting. Staring. I don’t recall exactly when, but at some point I noticed something that I hadn’t noticed before in months and months of sitting in that very space. More than 20 years away from that moment, I don’t have even a foggy recollection of what that first thing I noticed was. I do recall that it occurred to me… ‘I don’t know this place as well as I thought I did.’ So I started trying to notice new things. This extended reasonably quickly into connected spaces and poking around, opening doors and generally being curious about my environment. Rings are ridiculously fun, by the by. And, yes, I’ll be careful, Mom (and Sven and Alex). 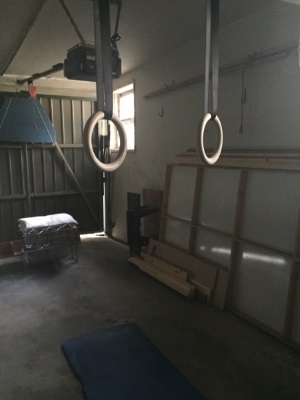 After I had decided to start this exercise adventure but before rings came into the picture, there was a brief time where building some sort of structure in the back yard was under consideration. I ended up getting some rings – they’re so versatile, and I’ll have… wow… YEARS of work exploring what can be done with them – but that notion of designing and building still appeals to me. In class the other day students were working diligently on their prototypes and in that little lull I decided to reach back to my architecture roots and model something for construction in my current game engine of choice, Unity. Past and present collide! The object of my efforts: the exercise structure described here by Calisthenic Movement’s Alex (El Eggs). I tell my students every term that their blogs are a great place to showcase their passion for games and game development. I tell them that every term and here sits my own blog. Empty. Neglected. FORGOTTEN.